I was contacted recently by the good folks at Country Bob’s All Purpose Sauce asking if I would be willing to try the sauce and give a review. Of course, I said yes and they sent me two bottles of the sauce in the mail along with several recipes. World’s Best Burger caught my eye and I had to see if it lived up to the name. 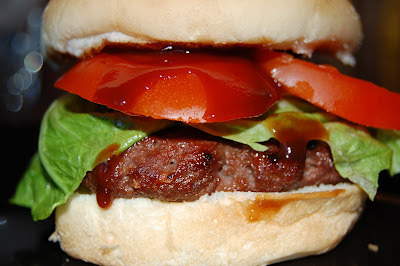 Burgers also provide a great excuse to eat french fries, which tasted great dipped in Country Bob’s All Purpose Sauce. I’d never had Country Bob’s All Purpose Sauce before, but the packaging looked familiar. The sauce is sold in various groceries around the country. In my town, I found it at Walmart and Kroger. Country Bob’s Sauce has a smokey, sweet, slightly tangy taste. It added so much flavor to the burgers. My husband, oldest son and I liked dipping our fries into the sauce, but the two younger kids found that a bit too tangy for them. The sauce is thinner than barbecue sauce, but full of flavor. Combine all the ingredients and form into patties. Grill and top with extra Country Bob’s Sauce. The people at Country Bob’s All Purpose Sauce are going to give away 2 bottles of sauce to 2 different winners. All you need to do to win is leave me a comment. I’ll pick 2 winners on Friday. I’ll also share the recipe for Country Bob’s Pickin’ Food on Friday. It’s a good thing I took pictures, because it sure didn’t last long. I LOVE COUNTRY BOB’S. I’M FROM SO. ILLINOIS WHERE IS IS MANUFACTURED! Wow! That burger looks Awesome!! I’ve never tried country bobs, but it sounds great! Wow these sure do look good, and just in time for Grillin’ Season!! We don’t have a country bob’s market here, but I”ve been to the website before. There are tons of recipes to try. Your burger looks yummy. Sounds like that is what for dinner tonight. The burger look great! 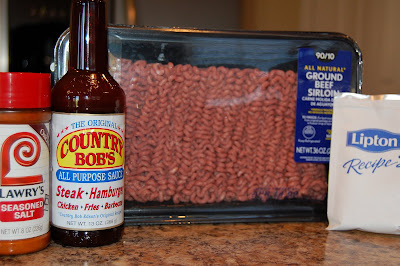 My son only lets me make burgers if I have County Bob’s sauce! It’s also great on chicken!! We love burgers around here, and I like to shake things up a bit! These sound(and look) so good!! it’s not dinner time and I’m drooling! I’m looking for that sauce in my grocery. My son is salivating just looking at the picture! I guess I’m in for the sauce. I saw this sauce on another blog just this morning a googled it to see where I could buy it around here!! The burger looks great!!! Hi, I came to check out your blog from 31dbbb forum and it’s great!!! I posted in the mom blogger section as well! That burger looks so delicious!! I am going to have to try it!! Yum, yum and yum some more. When can we come over for dinner!? Thanks for the recipe…just in time for grilling season! It is so exciting to have someone ask you to review their products! Soon they will pay you for advertising on your blog. I can say I knew you when…. Congrats and the burger looks good! Oh, that looks SO delish! Thanks for the giveaway – awesome! Man, that looks good. We LOVE burgers at Chez Brochette. Count me in! Check out what’s cooking under the bulb at…Lightbulb Cuisine. Real food from an Easy Bake Oven. I use Country Bob’s too! And your burger looks delish! I have never heard of the sauce either. As for the packaging….could be it looks familiar because that bottle is similar to many bottled sauce products…….that and a beer bottle. Never heard of Country Bob’s so I’d love to try it. Burgers look terrific! I’d love to try a new sauce! Sounds yummy! I have never tried Country Bob’s Sauce. I’m not sure I’ve ever seen it?!?! I would love a chance to cook with it though. That burger looks delish! If it was my house I’d have to be very quick in snapping a pic. That would last about 5 seconds with my hubs! That burger looks amazing. Now I’m craving one. Am I too late? I love me some good seasoning sauce. I’ve never heard of this one. we’re always on the lookout for new sauces to try when we grill out..this sounds like something we’d love to try!! 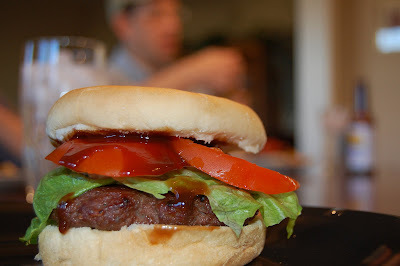 I also just did a post about the best burger ever. But mine was from the burger joint of my youth. haahaha… I missed the deadline. If I would only read the dates…. still, I might have to order some Country Bob’s one of these days. Love Country Bob’s!!! I’ve been eating it for years. My 12 yr old daughter loves it too!! That burger looks delicious, I can’t wait to give it a try! I have never heard of Country Bob’s, but I will look for it now. My picky grandkids introduced me to Country Bobs Sauce when they were quite young. That is the only way they would eat any kind of meat! They are better now but I still keep Country Bobs on hand and this Worlds Best Burger is one I will definitely try!